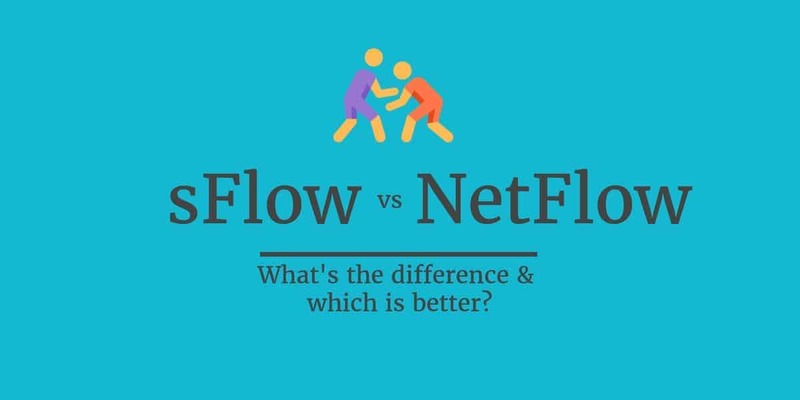 NetFlow vs sFlow: What’s the difference and which is better? Sam the network administrator is heading out to top off the morning’s first cup of coffee when there’s a cellphone chirp. Sam pivots back toward the desk. The text message announces there’s a spike in traffic on one of the organization’s WAN links; the anomaly triggered an alert that Sam had configured into the network traffic monitoring and analysis tooling. 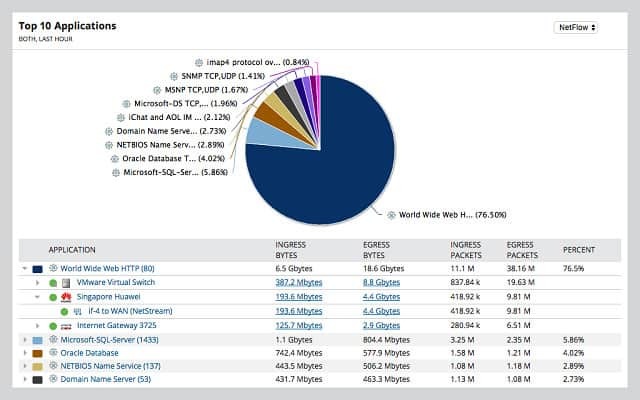 Sitting down, Sam opens up the analyzer’s dashboard and skims across the pie charts, graphs, and other indicators that summarize current and historical traffic across the organization’s network. With a few clicks Sam drills down into the data, zeroing in on the root cause of the traffic spike. Sam will be able to correct this situation before the first plaintive “Why is the network so slow?” calls start to trickle in. Then, coffee. A modern organization depends on its sophisticated high-performance network, and so traffic monitoring and analysis have become everyday duties. Your smoothly-flowing network might be roiled by failing hardware, badly configured systems, bandwidth hogs, and congestion due to social media and non-business apps. Traffic flows can also indicate distributed denial of service attacks, phishing campaigns, botnets, and anomalous activity cause by advanced persistent threats. Brute force password cracking attempts, data interception and modification, and “man in the middle attack” activity can also be identified by traffic monitoring. Monitoring the network and analyzing traffic provides early warnings of anomalies, as well as the tools to diagnose and troubleshoot reliability and performance issues, including congestion problems, hardware glitches, and security incidents. Monitoring and analysis also provides the insight needed for long-range network planning. The detailed packet sniffing provided by old standby tools such as tcpdump and Wireshark is still useful for diagnosing and troubleshooting; but traffic monitoring and analysis also needs the “30 thousand foot view” that shows the overall state of the network and ongoing trends. That kind of visibility is possible because of technologies for accumulating metadata about traffic flows. In sophisticated networks, devices such as routers and switches assist with monitoring by serving as exporters, transmitting information about the traffic passing through them to central collectors which receive, store, and preprocess the traffic data for analysis and report generation by analyzer tools. There are two major approaches to accumulating traffic flow data, NetFlow and sFlow. Both approaches are “under the hood” technologies, not directly visible. Both NetFlow and sFlow have two components. One piece resides deep inside a variety of different devices (e.g., routers and switches); the other piece, the human-facing part, lives in a wide range of different monitoring/analysis applications that process the data exported from the first part. Both approaches have their partisans. We’ll look at what they are, how they differ, and when one is better than the other. NetFlow was originally a feature of Cisco routers aimed at optimizing packet switching and ACL processing, and was found valuable for traffic monitoring. Several non-Cisco vendors also support NetFlow. NetFlow notes and reports on all IP (Internet Protocol) conversations passing through an interface. (At least, “all” was true originally; but see below about Sampled NetFlow.) NetFlow is stateful and works in terms of the abstraction called a flow: that is, a sequence of packets that constitutes a conversation between a source and a destination, analogous to a call or connection. A NetFlow exporter device collects data on the IP traffic entering/exiting the device; it inspects packets and groups them into flows by inspecting particular fields: the source and destination addresses, protocols, ports, etc. Data on observed flows is rolled up from the packets and cached locally (in the flow cache), then it’s periodically exported to the collector based on active and inactive timeouts. NetFlow thus only handles IP, focusing on OSI Layers 3 and 4. Its knowledge of the IP protocols enables it to interpret packets and work in terms of flows. In contrast, sFlow is a stateless packet sampling protocol that’s aimed at monitoring high speed networks. The “s” in the name is significant: sampling. However, the “Flow” part may be misleading: sFlow works in terms of packets only, it has no notion of aggregating packets into higher-level “flows”. The sFlow standard was created by InMon Corporation and was made public in 2001 through the publication of RFC 3176. InMon handed over the management of the standard to an industry consortium, called sFlow.org in 2003. Today, many vendors support sFlow in their devices. sFlow provides general purpose packet sampling, spanning Layers 2 through 7, and is designed to be built into any network device. An sFlow exporter simply collects the prefixes of a subset of the packets passing through the device. The exporter samples one out of every n packets, where “n” is the chosen sampling rate; it also selects some random packets to include. It gathers the initial bytes of all sampled packet into sFlow datagrams, along with device counters, and sends the resulting UDP datagrams to the collector. There is thus no flow cache at the device. A key characteristic of sFlow is that the strategy of sampling is scalable to high speed networks; more on that below. Both NetFlow and sFlow have acquired extensions over time. Flexible NetFlow and IPFIX provide the ability to have vendor-extensible templates for tweaking the set of packet fields of interest. NetFlow v9 and IPFIX also add the ability to monitor Layer 2 fields. Sampled NetFlow adds the option of doing sampling to NetFlow (sampling is mandatory in sFlow). For sFlow v5 adds the ability to export host and application related data along with the packet prefixes and counters. All extensions depend on having hardware that supports them, the correct system software, and analyzer consoles that will work with them. Here are the main differences between the two technologies. NetFlow’s partisans have long argued that NetFlow can be more accurate than sFlow. NetFlow aggregates data about all packets into flows locally at the device; thus it can’t by happenstance miss a conversation by failing to sample the relevant packets. This granularity of NetFlow is attractive for examining traffic with an individual host. It’s easy to see per-host details, notice localized anomalies, and investigate particular flows. But as traffic volume mushrooms, it becomes less and less feasible to collect every flow. If you’re not doing sampling, scalability becomes an issue. sFlow is thus more scalable than traditional NetFlow. However, sampling has the downside that there may be gaps in visibility. The packets sampled may not reflect every flow (for instance, short bursts). For detecting and drilling down to investigate security issues, this can be significant. As noted above, sFlow does minimal work on the network device, versus NetFlow which uses the device’s CPU and RAM to implement the flow cache. This can become a problem with high speed devices where many conversations are concentrated onto a link. The additional CPU load on top of the “real work” the device is doing increases based on the number of flows per second, and can consume a significant fraction of the CPU per a Cisco whitepaper (PDF). In contrast, sFlow generally does its packet sampling in the switching/routing ASIC, letting the network device’s CPU concentrate on its core job. At volumes of hundreds of gigabits per second, such as in edge routing and large datacenters, traffic engineering becomes the central concern; the focus is on large-scale patterns and abrupt shifts in volume. Fine-grained visibility into individual hosts becomes less significant. Now sampling starts to become the clear winner. Because of this, NetFlow has added the option of Sampled NetFlow, which makes NetFlow scalable — but loses that accurate high granularity of traditional NetFlow. NetFlow is IP only (with some Layer 2 support added recently). Thus legacy protocols (e.g., Appletalk, IPX) and other non-Internet protocols do not show up. In contrast, sFlow can cover Layers 2 through 7.
sFlow can have lower latency than NetFlow. A device collecting NetFlow metrics in its flow cache exports them periodically based on active and inactive timeouts. Thus reports on recent and ongoing conversations may be delayed, depending on the timeouts. In contrast, sFlow sends collected packet prefixes and counters in real time. If sub-minute latency is a concern — and your monitoring/analysis tooling supports it — sFlow may be the better choice. NetFlow and sFlow are rarely used in isolation. 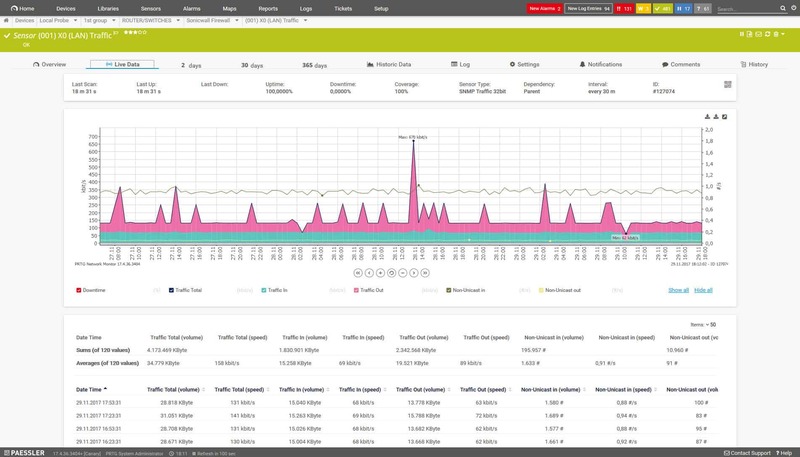 To get a full picture of your network traffic and head off performance issues, you need to be able to access a range of metrics. Advanced network monitoring tools check on the health of network devices with SNMP, monitor network traffic with NetFlow and sFlow, and also use Windows Event log and Syslog data to ensure that all user actions are following regular task patterns. So, to monitor your network effectively, you need to deploy advanced network monitoring tools. In this section of the guide, we will outline our recommendations on which tools you should consider. You can read more details about these three top tools in the following sections. SolarWinds is a leading producer of network monitoring software. Its key product is the Network Performance Monitor, which focuses on network device health through the use of SNMP procedures. However, to get NetFlow and sFlow capabilities, you need to go for the company’s NetFlow Traffic Analyzer. These two products dovetail well together because they are written on a common platform, called Orion. These two network monitoring tools are frequently bought together and SolarWinds offers them in a pack, called the Network Bandwidth Analyzer Pack. The name of the NetFlow Traffic Analyzer suggests that the tool only monitors Cisco NetFlow messages. It does have NetFlow capabilities but it can also manage Juniper J-Flow, sFlow, Huawei NetStream, and IPFIX messaging systems. As well as monitoring networks, the tool can help you fix traffic flow problems by implementing Class-based Quality of Service and other queueing methodologies. You can get a 30-day free trial of the Network Performance Monitor and the NetFlow Traffic Analyzer. Getting both components gives you access to a number of very useful cross-modular tools, such as the NetPath critical path visualization tool which shows you where bottlenecks are holding up traffic flows. Another useful tool that requires both of the SolarWinds network monitoring tools is the PerfStack system, which shows the layers of services and underlying infrastructure that contribute to the delivery of each application. 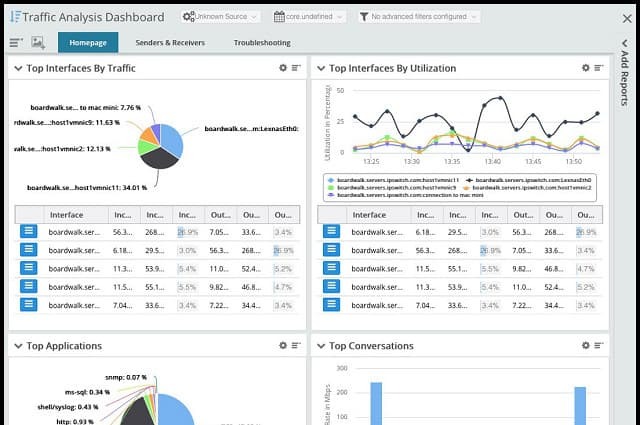 If you don’t feel that you need all of the features of the NetFlow Traffic Analyzer, you could opt for the SolarWinds Flow Tool Bundle, which is free. This tool gives you the opportunity to collect NetFlow v5 messages on your network and get samples of actual data traffic. The Flow Tool Bundle also includes a network traffic simulation feature. However, you don’t get all of the extras that are included in the NetFlow Traffic Analyzer, such as CBQoS monitoring or the PerfStack module. Paessler PRTG is a unified IT infrastructure monitoring tool that covers networks, servers, and applications. The scope will come in handy once you have isolated your Netflow and sFlow messages to glean network traffic information because you will probably want to analyze the source and destination of traffic and find out which applications are generating the most traffic volume. The PRTG system is actually a collection of tools that all contribute to network analysis, providing live feedback as well as the visualization of historical data. Each of these tools is called a “sensor.” The PRTG package is shipped with the full set of available sensors and you customize the system by deciding which sensors to activate. Among the available sensors in PRTG are NetFlow, sFlow, and jFlow monitors. PRTG includes three NetFlow sensors, which follow the NetFlow v5, NetFlow v9, and IPFIX. Another sensor in PRTG picks up sFlow v5 messages. If you want to investigate another alternative to NetFlow and sFlow, you could also look into the jFlow sensor of PRTG. You don’t need to configure PRTG to work with any of these network device messaging systems, it will pick them up automatically. Paessler charges for PRTG in charging bands based on the number of sensors that get activated. If you only activate 100 sensors, you can use the system free of charge. You can also get a 30-day trial of PRTG with unlimited sensors. WhatsUp Gold is a network monitoring tool that focuses on network topology and device health. The system is produced by Ipswitch, which all markets a range of addons to the system that extend its capabilities. These extras include the Network Traffic Monitor addon, which includes NetFlow and sFlow monitoring. Unfortunately, you can’t just buy the Network Traffic AnalayAnother monitoring system on its own. You have to install the base WhatsUp Gold system first and then get the Network Traffic Monitor. This monitoring tool is able to pick up NetFlow, NetFlow Lite, and IPFIX. It can also process sFlow, jFlow, and QUIC data. IPFIX — Internet Protocol Flow Information eXport was developed and is maintained by the Internet Engineering Taskforce to provide a universal version of NetFlow. The design was based on NetFlow 9 and many people refer to IPFIX as NetFlow 10.
cflow — created by the Center for Applied Internet Data Analysis, cflow is implemented by cflowd, which is available for free from CAIDA. The cflow system adds data manipulation functions to the gathering of NetFlow messages. J-Flow — this is a copy of NetFlow created from NetFlow v5 by Juniper Networks for use by its equipment. The initial version was J-Flow v5 and whenever Cisco produces a new version of NetFlow Juniper creates a copy for J-Flow with the same release number. NetStream — Huawei followed the same course as Juniper networks and created its own version of NetStream for its network equipment. Huawei Support refers to the definition documents of both NetFlow 9 and IPFIX when explaining the NetStream system. NSEL — Network Secure Event Logging is a Cisco standard that channels messages from firewalls through the NetFlow messaging system. As you can see from this list, just about every network flow messaging system that purports to be alternatives to NetFlow and sFlow is really a version of NetFlow. There are several factors to consider in choosing either NetFlow or sFlow. Your installed hardware base may make the decision for you; what do your devices support? Consider also your traffic volume versus your need for fine-grained visibility, and the range of protocols on your network. Happily, many enterprises can use both technologies, using each one for what it’s best at, and using analyzer tooling that merges the data into a single view. Great job John. Sampling is more popular with organizations exporting massive amounts of flows. To try and avoid sampling, some companies choose to modify the tuple where the source and destination port are excluded from the export and replaced with an application tag. This can reduce flow volumes by over 80%. The data is still accurate but, the missing ports makes them less useful for abnormal behavior monitoring. Thanks for posting.